"Metal Men" - Part 2: "B.I." Doc Magnus reveals that the Metal Men are at the WayneTech installation on a field exercise for the benefit of Lucius Fox. Later Bruce Wayne confronts Lucius about the matter and even though Bruce isn't happy about how things went down he decides to meet with Magnus. Meanwhile Superman interrogates Metallo and after a bit of intimidation Metallo reveals that he has no earthly idea what he was so desperate to steal adding that he barely remembers any of it. Using his x-ray vision Superman peers into Metallo's skull and makes a surprising discovery. After his meeting with Magnus Bruce Wayne joins Superman in the Batcave to discuss what the Man of Steel has uncovered. Despite the clarity of Superman's drawing Batman feels a direct examination would be more helpful. Superman brings an unconscious Metallo to the cave and the two realize that Metallo's brain has been infected by a computer virus. They trace the signal that was used to implant the virus to an orbital platform in space where the two heroes are attacked by Brainiac. Batman's suit is damaged and Superman has to get him back to Earth as quickly as possible. Back on Earth the Metal Men fall under Brainiac's control and go after what the sentient computer had been trying to steal. After getting Batman to the hospital Superman flies to WayneTech only to discover that the thing Brainiac had been trying to steal was a prototype for the OMAC Project. Story - 3: So in a month's time my opinion of this story just completely deteriorated to the point where I really just want to go into hibernation until the next story arc begins. The addition of Marc Guggenheim in the writing credits helped a bit but overall I am finding this story to be rather dull. It shouldn't be. You have Brainiac. You have the all new, all different Metal Men. Metallo's involved and Superman and Batman are present and accounted for. All the ingredients are there for an exciting and action packed story. Instead I'm rather bored with the whole endeavor. I was hoping for more based on the first issue, which was pretty solid, but all of the reveals made in this issue left me feeling like there should have been more to it than what we were given. Metallo's under Brainiac's control. Big deal. The Metal Men are taken over by Brainiac proving that they are as untrustworthy as Bruce Wayne thought they might be. Yawn. Superman finds out that Batman kept an OMAC Project prototype. How could he? Every reveal. Every bit of characterization. Every action scene. All of them feel so forced and lifeless that they story suffers for it. I mean I know that Batman is a bit of a jerk, but his attitude towards the Metal Men seems a bit out of place considering how many times they have assisted in saving the world. Oh wait, this might be the first time he has met the Metal Men. Then again it might not be. The dialogue in the beginning was a bit confusing on that issue. Sigh. I hate disliking this story, but I am fast coming to the conclusion that teaming up Batman and Superman in a monthly title may not be the best of ideas because eventually the stories are going to become very tired. Art - 4: The artwork for this issue wasn't bad but I wasn't all that thrilled with it either. Admittedly I could be transferring my aggravation with the story onto the art, which isn't all that fair but sometimes you can't help feeling what you feel. The Metal Men still looked good. Pat Lee is great with robots. The backgrounds and establishing shots looked great as well. It's the people I had the problems with. Everyone looked a bit...off. When Bruce Wayne has an angry expression on his face it looks more like he has a toothache rather than him being mad or upset over something. So the art wasn't terrible, but it didn't thrill me either. Ah well. Brainiac looked kind of cool. Cover Art - 3: This cover gets a three for spoiling what should have been a great reveal. 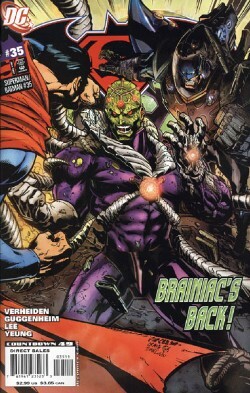 It's a rather dynamic cover but the fact is that going in knowing that Brainiac was the villain just ruined the pacing of the story because any element of surprise is gone and when Superman and Batman find out that Brainiac is behind everything there's no heart or emotion to it because we already know what's going on. On a technical level this was a great cover. As a reader I thought it was terrible.